To upgrade the A6 from Randalstown to Toome, and from Toome to Castledawson to dual-carriageway (partly online, mostly offline). Existing Toome Bypass to remain as-is. See below for photos and maps. Click here to jump straight down to scheme updates. The A6 is single-carriageway from the end of the M22 at Randalstown, to Derry. 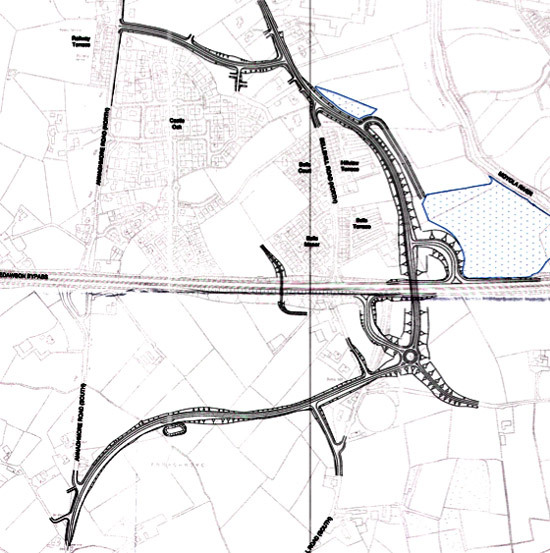 The most notorious bottleneck, the village of Toome, received a dual-carriageway bypass in 2004. However the roads on each side are still single-carriageway. The purpose of this scheme is to dual approximately 12km of the A6 from the M22 to the start of the Toome Bypass, and from the end of the Toome Bypass as far as Castledawson. In keeping with recent schemes, the two new stretches of dual-carriageway will be of a high quality with flyover junctions and no breaks in the central reservation. Traffic levels on the route vary from 12,000 vehicles per day at Castledawson to 17,500 per day at the M22 end. The existing Toome Bypass was to have been upgraded as part of the scheme with both roundabouts removed, and the Hillhead Road T-junction west of Toome would have been closed. As of late 2010 this decision has been reversed, so both roundabouts will remain (Roguery Road will be enlarged) although the Hillhead Road T-junction will still be closed. This is unfortunate and short-sighted as it means what is otherwise a continuous free-flowing road with grade separated junctions from Belfast to Castledawson will have two roundabouts in the middle. The map below was released to the press by the Roads Service in September 2005. It shows the western part of the scheme at the top, and the eastern portion at the bottom. The recently completed Toome Bypass has been added in black. Individual junctions are not shown. 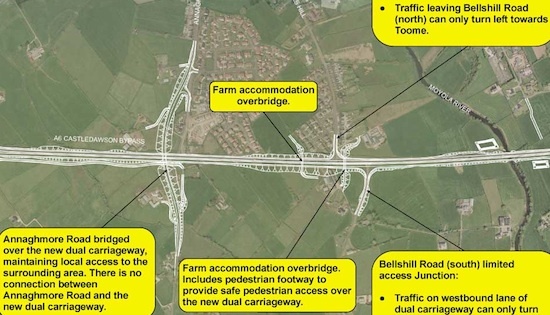 The design of the scheme has been generally accepted with the exception of the connection between Bellshill Road and Annaghmore Road in Castledawson, which has (as of Jan 2013) twice been rejected at a Public Inquiry and is now being reconsidered a third time. The controversy has related to (a) the way in which locals will access the upgraded A6 from these two roads and (b) the impact of new connector roads on local residential and agricultural property. The maps below show the evolution of the proposals. ABOVE: Original design proposed but rejected at 2007 Public Inquiry. ABOVE: Revised design submitted at 2012 Public Inquiry but again rejected. ABOVE: Inspector's recommended design as of 2013. ABOVE: Roads Service's revised design as of June 2013, which is their refinement of the inspector's suggested design (compare to previous map). You can see this map in more detail here. The original grand motorway plan of 1964 would have seen the M22 extend from Antrim past Toome and terminating at Castledawson. (Londonderry traffic would have followed the M2 as far as Ballymoney and then taken the proposed M23 to the city). When this scheme got abandoned in 1975, the M22 had not even made it as far as Toome and it left the single-carriageway A6 as the most direct route to Londonderry. It has been in this state for the intervening 30 years with the narrow and twisty section from the M22 to Toome one of the poorest standard trunk roads in Northern Ireland. See also route map above. This is a strip map of the design that is being built as of 2018. The existing Toome Bypass, which will remain in situ, is highlighted in yellow. 24 Mar 2019: Another update, this time firstly to draw attention to two aerial movies which between them show the entire stretch between Castledawson and Toome, including parts that haven't been seen in aerial movies in a while. This is the most challenging part of the scheme as it runs through some very boggy ground with several overbridges required. 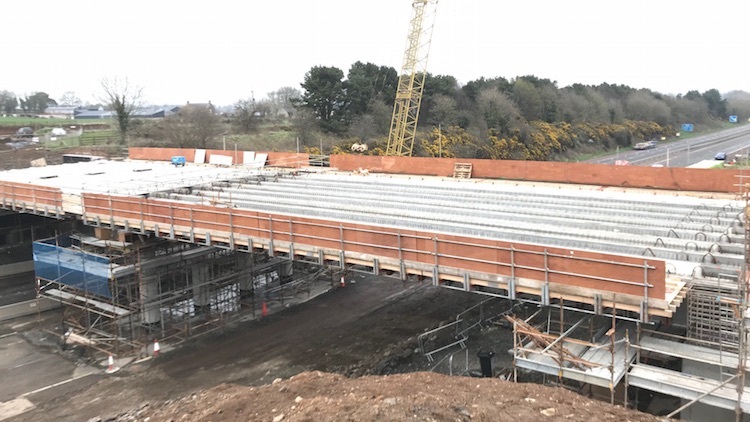 The first movie begins at Castledawson Roundabout where you can see progress on the two new footbridges that are being built here. With all traffic now using the future westbound carriageway, the old A6 has been excavated and the foundations of the future eastbound carriageway are taking shape. You can see interesting features including a layby and an agricultural accommodation laneway at 0:21. Bellshill Road flyover, well advanced but not yet open, is seen at 0:45. Jumping then to the second movie at the Moyola River Bridge we continue to the rather convoluted temporary road network where the future dual-carriageway diverges from the existing A6 at 0:20. We reach the future Hillhead Road junction at 0:45. The embankments are completed, and are probably now being left to settle for a few months before work begins on the bridge. Between here and the Deerpark Road junction at 1:30 is one of the least-developed stretches, where progress is largely limited to topsoil removal. This may well be one of the last sections to be built. Deerpark Road junction itself is progressing well with the bridge in place, but no sight as yet of the embankments on either side. The next stretch, from 1:40 to is the environmentally-limited section that runs close to Lough Beg. The whooper swan overwintering period is finally over so work has now resumed on this stretch, which includes topsoil stripping, a culvert at 1:50 and an accommodation overbridge at 2:10. The stretch from here to The Creagh junction appears to have been built up with an embankment. I'm not sure whether this is the actual road embankment, or whether it's a surcharge designed to compact and settle the ground below. The video reaches The Creagh junction at 2:40. This is similar to Hillhead Road junction, in that the embankments are completed, and are probably being left to settle. The future road re-joins the A6 near Toome at 3:00. 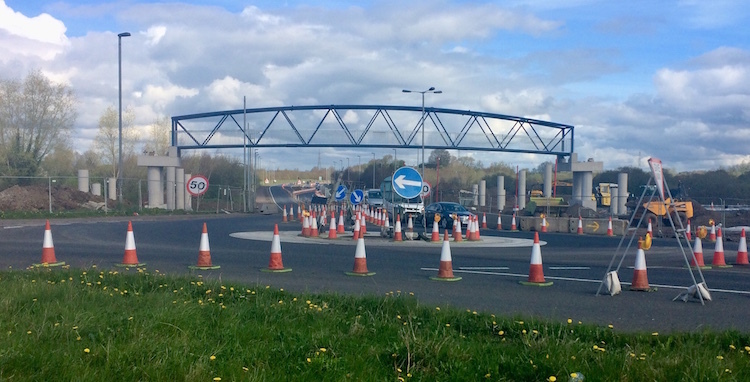 The current right-turn into Toome on the Belfast-bound carriageway is being closed as part of the project, and the Hillhead Road is being diverted onto a new local road that you can see being built to the right of the main road at 3:10. A very interesting video. Secondly, the contractor has put up a new update on their web site here which contains more details. 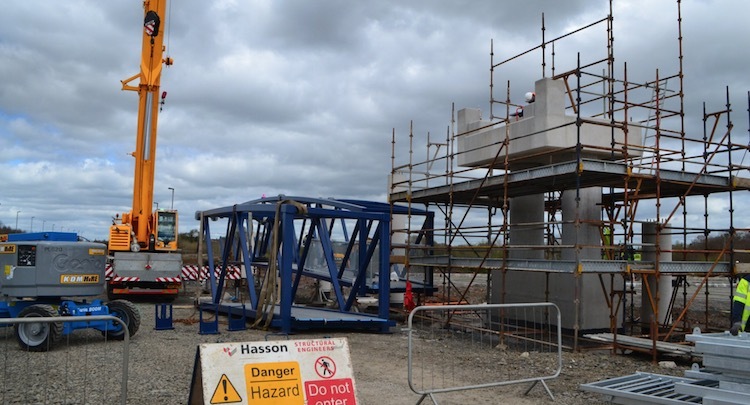 I am not going to repet everything from there on this site, but it contains pictures and a movie of the Deerpark Road beam lift as well as ground-level photos of the offline section between Randalstown and Toome which is now due to open in "mid/late summer 2019". If the borrow pits are your thing – and let's face it, they're fascinating wee blighters! – there's also details of what's happening to those. There are some excellent photos in this update, so please pop over and have a look. We are now almost at the half way point of this four-year with scheme with almost two years under the belt and two more to go until the whole road is open to traffic. 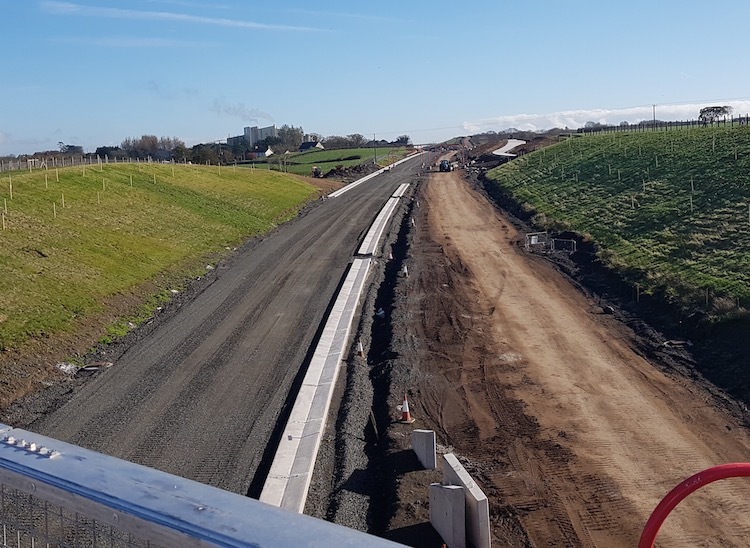 6 Mar 2019: We are now on the countdown to the opening of the first part of this scheme, namely the offline stretch from the end of the M22 at Randalstown to Toome which is currently scheduled to open during the second half of July, ie just over four months from now. Exciting times! 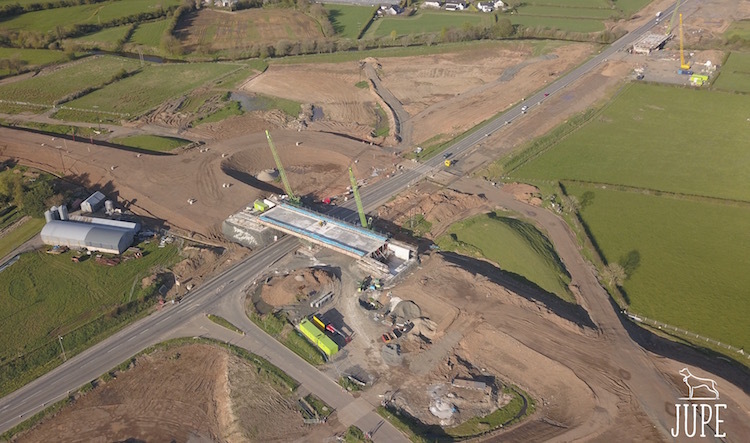 Work on the Randalstown West junction – where the M22 will join the new dual-carriageway – is progressing well, as can be seen in this aerial movie taken on Monday. Meanwhile, Arthur Ming has shared more photos of the Deerpark Road junction with its beams now in place, two of which I reproduce below - thank you Arthur. Work is now getting underway on the approach embankments for this bridge, as can be seen in this aerial movie, also taken on Monday. 10 Feb 2019: A quick update to share two photos that were taken on 7 February by Arthur Ming, showing the work at Deerpark Road (on the offline stretch between Castledawson and Toome). 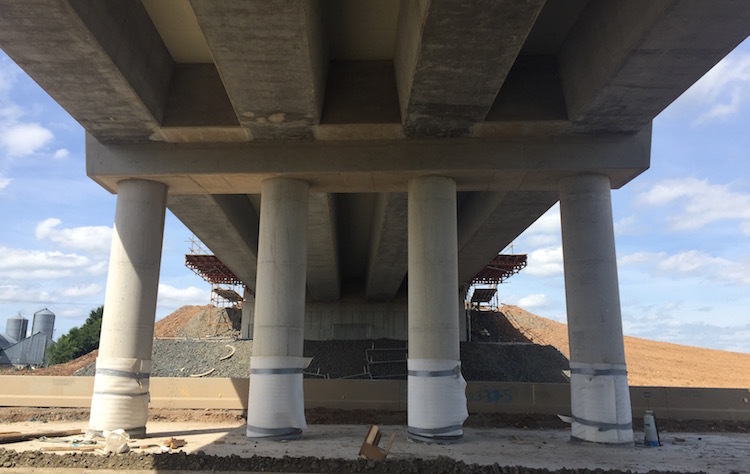 Both views are looking west from the current Deerpark Road towards the two bridge abutments and one set of central pillars that will eventually carry the realigned Deerpark Road over the future dual-carriageway. The beams for this bridge are due to be lifted into place on 16/17 February, after which the bridge deck will be built. After that, presumably, work will take place to divert Deerpark Road over it to allow completion of the new road below. Thanks Arthur! 6 Feb 2019: The contractor has put up a new video, dated yesterday, of the stretch from Toome to Randalstown, visible on YouTube. It shows this stretch very advanced, with tarmac in place now on long stretches, including much of the eastbound carriageway and now sizeable stretches of the westbound carriageway too. Most of the drainage also seems to be in place too, and hundreds of saplings appear to have been planted along embankments on the stretch too. Parts of the site are already starting to green over. 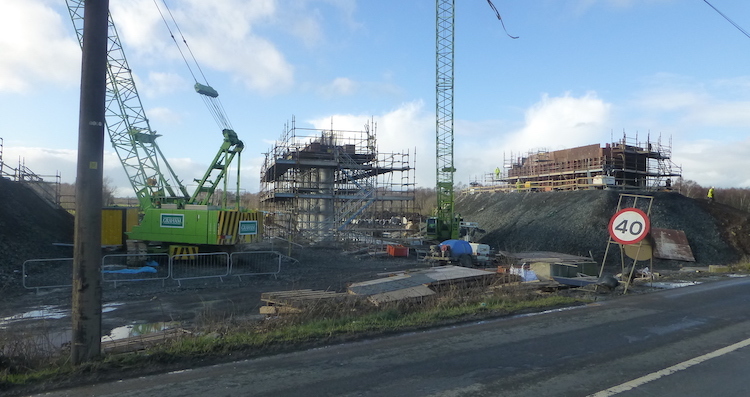 Towards the end of the video you can see that the borrow pit at the Randalstown West junction is now being filled in. 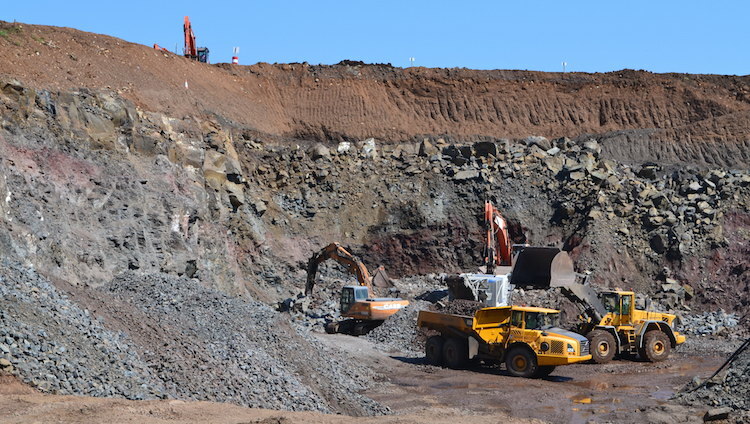 The borrow pit was used to extract high quality rock for construction, and is now being replaced with low quality earth. The aim is to achieve a cut/fill balance, minimising the amount of material that has to be disposed of off-site. We are anticipating the opening of this section by the summer. The contractor has also updated their own web site. 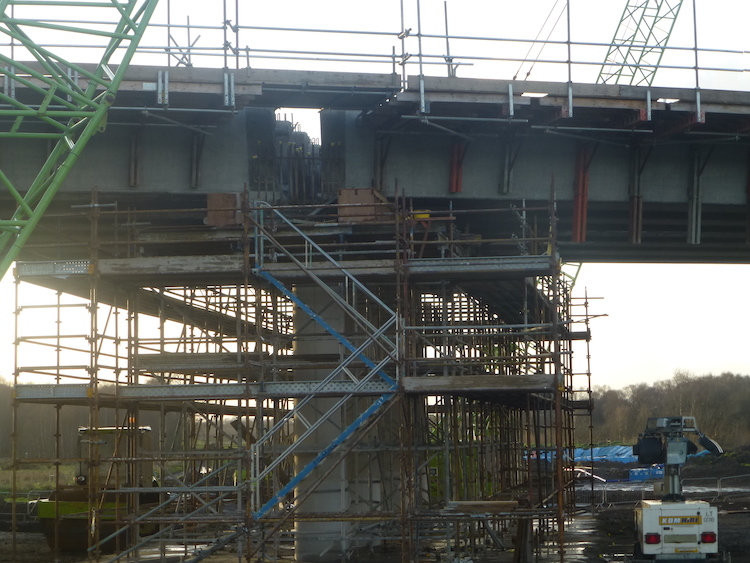 I won't repeat everything here, but highlights include the beam lift at Deerpark Road (between Toome and Randalstown), now scheduled for the weeked of 16/17 February. You can see the three sets of supports in place in this video. Drumderg Roundabout is also to be realigned (for the umpteenth time) this coming weekend. Bellshill Road south of the new dual-carriageway is currently closed, and will remain so until late March. This will be followed by a full closure of Bellshill Road north of the new road from 25 February until early May. This is to allow the contractor to reconnect the local roads to the new grade-separated junction that's being built here. 16 Jan 2019: Work is now underway once again after the Christmas break, and there have been more developments. As per usual, this information is partly sourced from the contractor's own web site and partly from YouTube videos which I shall link to. Starting at the western end, Castledawson roundabout is currently down to one lane to faciliate the construction of two footbridges that will allow easier pedestrian access over this busy junction. On the Castledawson Bypass, all traffic has been using the future westbound carriageway for about six weeks and stretches of the old A6 have now been excavated for reconstruction, as seen in this YouTube video posted last week. The video shows lots of earthworks especially around Hillhead Road (visible at 1:10). Just prior to Hillhead Road (visible at 1:02) you can see how the existing A6 has been moved onto the route of the future dual-carriageway which curves off to the north (left) at this location. In Castledawson itself, the new link road that connects Annaghmore and Bellshill Roads is well advanced and traffic is due to be diverted onto it in late February. The video ends at the site of the future Deerpark Road junction (1:40) where the bridge beams are due to be lifted into place on 9/10 February. At Toome, the contractor intends to carry out "realignment" at Drumderg Roundabout on the weekend of 25-28 January. This *might* mean switching A6 traffic onto the new S-shaped section of road that will link the current A6 to the roundabout after the dual-carriageway opens. You can see the section of road I mean in this YouTube video (on the left at 00:02). It might also mean altering the layout of Drumderg roundabout. This video extends along the full length of the offline stretch to Randalstown. You can see that tarmac has now been laid on the future eastbound carriageway on about 75% of the route. The Toome-Randalstown stretch is due to open to traffic in "mid 2019" so not long to wait now. It will probably open with one lane each way initially, and then open fully in due course. The video ends at the new junction at Randalstown (at 2:57) where you can see the road that loops over the bridge to connect to the westbound carriageway taking shape. 3 Dec 2018: A major milestone was reached today with traffic using part of the new A6 for the first time this morning. Traffic travelling on the Castledawson Bypass for the 2.2km between the Moyola river bridge and Castledawson roundabout were switched onto the future westbound carriageway - as tweeted by DFI's permanent secretary earlier - and Bellshill Road was also reopened. Work will now begin on building the eastbound carriageway on the site of the old road (I say "old", but it was actually itself only opened in 1992!). Well done to the contractor for reaching this point. The contractor has put up an update with photos on their web site here - what follows is a few key points pulled out of that. Closer to Toome, work on the Deerpark Road grade-separated junction continues to progress with piling, bases and column works now complete. Work is currently focused on the bridge abutments are the beams are due to be lifted into place during January. Work is now also underway for the new pair of footbridges that are being added to Castledawson Roundabout. All of the above can be seen in this aerial movie, posted last week before the carriageway switchover, starting at Castledawson Roundabout and moving east along the Castledawson Bypass. Meanwhile, on the offline stretch between Toome and Randalstown work progresses steadily. The deck is due to be poured on what the contractor is calling "Pearsons Accommodation Bridge", though I'm not aware of any maps in the public domain that would allow us to identify where that bridge actually is, since Pearson is probably the name of the landowner. Two aerial movies of this stretch of the scheme were put online a week ago. This one shows the western 2km, starting at Toome and working east with the road foundation largely in place and drainage works evident. Towards the end you can see a future layby on the westbound carriagewway. This movie shows the easternmost 1.3 km of the same stretch, ending at the M22 at Randalstown. At the end of the movie you can see the "loop" that will allow westbound access to and from the new road taking shape. 11 Nov 2018: The dark evenings have really set in now, but work continues on this scheme which has now been underway for 18 months with just over two years to go until completion. Taking the scheme in three sections: At the western end of the scheme, work on the upgraded Castledawson Bypass (from the Castledawson roundabout to Hillhead Road) is very advanced, with the future westbound carriageway close to completion. All traffic will be switched from the current A6 to this new carriageway on the weekend of 30 November, so that the current road can be reconstructed to become the future eastbound carriageway. Progress is best seen via this computer-generated flythrough dating from four days ago which begins at Castledawson roundabout and works its way east. There is only one grade-separated junction on the Castledawson Bypass - at Bellshill Road/Annaghmore Road (at 0:38 in the video) and Bellshill Road is currently closed to facilitate its realignment to the the new link road that is being built as part of the junction. On the offline stretch between Hillhead Road and Toome progress varies. The first stretch, from Hillhead Road to to Deerpark Road, starts at 0:56 in the video and you can see that earthworks are underway on both grade-separated junctions, but not much work evident on the stretch between them. The next stretch, past Lough Beg and on to The Creagh (not shown in the video) has seen relatively little progress and in any case work here has been paused until the spring due to environmental restrictions. The final stretch, the long offline section from Toome to Randalstown, is looking very advanced indeed with both carriageways constructed and tarmac being laid on a long stretch in the middle of the section. 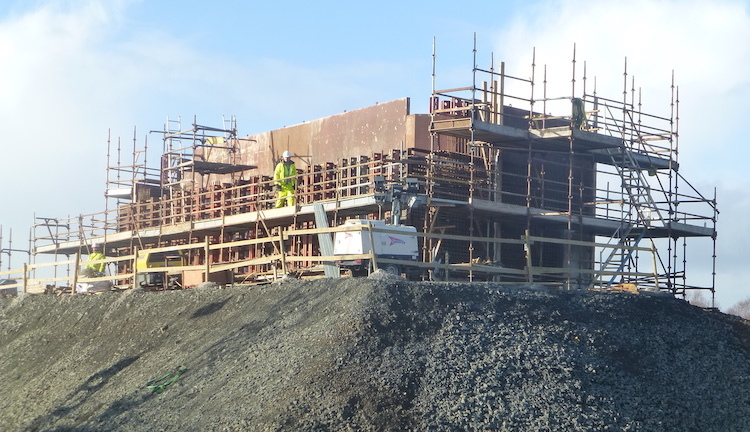 This computer-generated flythrough shows progress at the Castledawson end two weeks ago, while this video shows progress at the Randalstown end. The pictures below were taken from Ballynafey Road bridge by Chris Carter about three weeks ago (apologies to Chris that I have only shared it today). It illustrates how well advanced this section was in late October. We are now only 8 or 9 months away from the opening of the Toome to Randalstown stretch (next summer) so that will be a very exciting time for travellers! 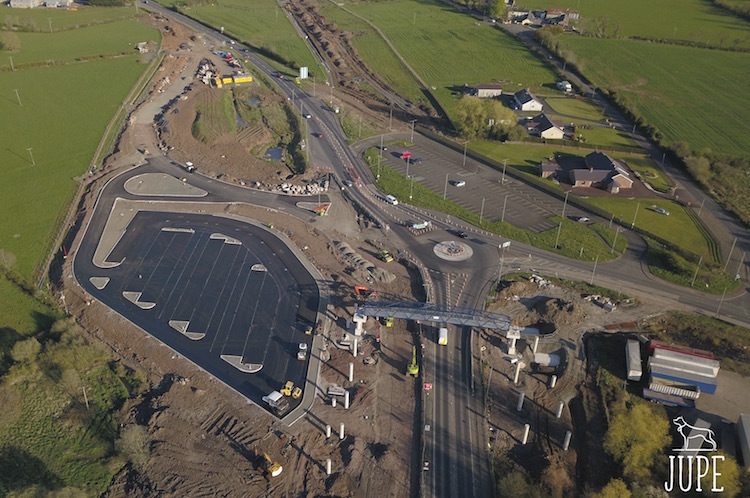 6 Oct 2018: The project continues to advance, with the opening of the new park-and-ride at Drumderg roundabout in Toome, and the accompanying footbridge, on 24 September as anticipated. The contractor has lost no time in ripping out the old park-and-ride, the site of which is needed for the enlarged roundabout. 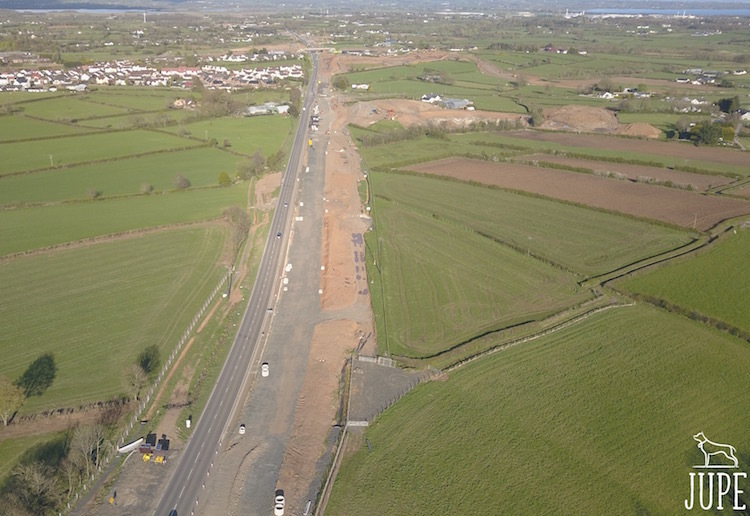 The enormous cutting at the end of the M22 is now essentially complete, so motorists can now see along the route that the future dual-carriageway will take from Randalstown (see photo 1 below). Progress on this stretch, which is almost entirely offline, can be seen in this computer-generated flythrough of the 1500 metres at the eastern end of the project. On the other side of Toome the offline stretch that passes close to Lough Beg, via Deerpark Road, is also advancing with substantial earthworks completed and the approach embankments for the Creagh junction and flyover now in place, as seen in this video. The same is the case further west where the new road rejoins the existing A6 near Castledawson, with the embankments for the Hillhead Road junction - though not the bridge structure - also in place. 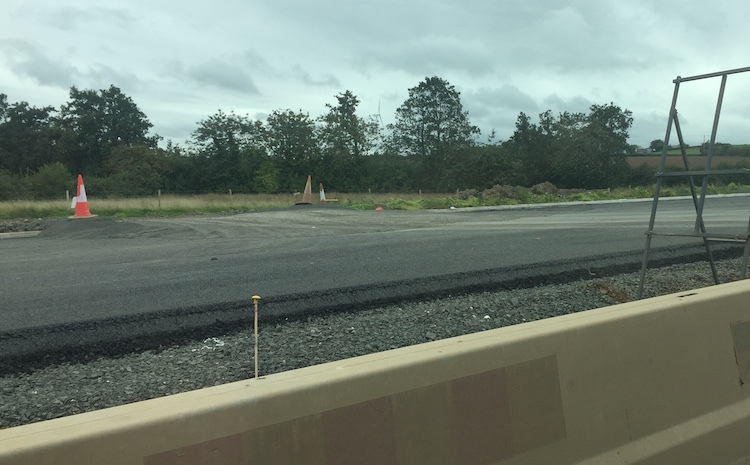 The Castledawson Bypass itself is the only stretch where the road is an online upgrade, and here work on the future westbound carriageway has advanced to the point that the final surface is being laid on the western part (photo 2 below). 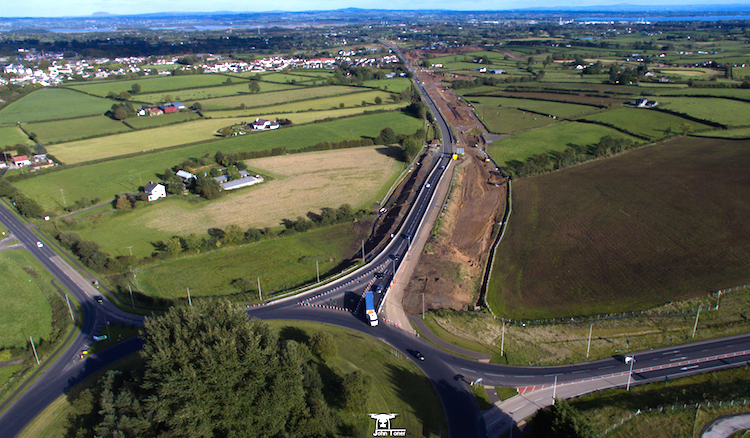 An aerial video of the Castledawson Bypass can be seen here, showing the progress on the future westbound carriageway. It will not be too long before traffic is transferred onto the new carriageway to allow the construction of the future eastbound carriageway. We are now less than a year away from the planned opening of the Randalstown to Toome stretch, though the more challenging Toome to Castledawson stretch is still about two and a half years away. Photo 1: View west along the route of the future dual-carriageway from the end of the M22 at Randalstown on 27 Sep 2018. The current Moneynick Road is seen curving to the right. Until a few months ago there was a huge hill just ahead which has now been cut away (same view before work began) [Wesley Johnston]. 12 Aug 2018: The project progressed well during July. You can read the contractor’s latest update on their web site here. As before, I’m not going to repeat everything here so I encourage you to click that link to get a feel for what’s been happening and what will be happening in the coming weeks. The two most notable dates are the opening of the new link road at Randalstown West (end of the M22) which connects the dual-carriageway to the new flyover. It is due to open on 3 September. The relocated park-and-ride facility at Drumderg Roundabout in Toome is then due to open in “mid” September. One of the most obvious recent changes has been that the bank at the end of the M22 at Randalstown has finally been cut through, so drivers can now see right along the route of the future dual-carriageway as they join the existing Moneynick Road. The amazing John Toner took a series of 360° panoramas at various sites along the new road on 25 July. (Although he sent them to me the following day I was busy attending the birth of NIRoads Junior #3 at the time and hence am only updating the site today!) He then took more at the end of the month. You can see them all by clicking this link. John has also created an interactive map that shows the location of each 3D panorama, available here. Thank you John - these pictures are amazing and give a real flavour for how things are progressing. 21 Jul 2018: A number of things to report. Firstly, construction on the scheme has now passed its first anniversary, which means that the eastern half (Randalstown to Toome is now over 50% complete) and we are now only a year from opening in "mid 2019". To celebrate, the contractor has put up an excellent first anniversary page that contains a summary of work to date, videos and an audio clip. There is no point in me trying to repeat it all here, so I suggest you pop over to the page and have a read! In terms of visible works, the beams for another bridge were craned into place last week - this was an accommodation bridge (a bridge that preserves access to private property) at "Dobbin's lane". The bridge consists of two spans (one per carriageway), each of which consists of two 66 tonne precast beams 29 metres long. Three of the photos below are of this lift, taken from a DFI tweet. 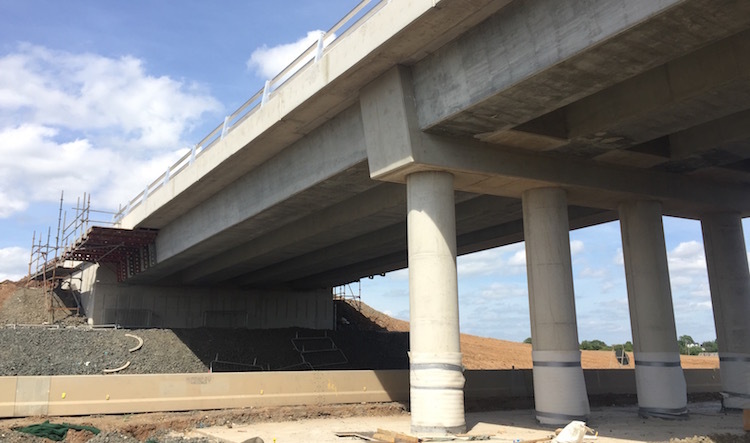 In addition, the first overbridge to be opened to the public came into use on Monday 16 July - this was the Ballynafey Road bridge, which carries a local road over the new dual-carriageway between Randalstown and Toome. 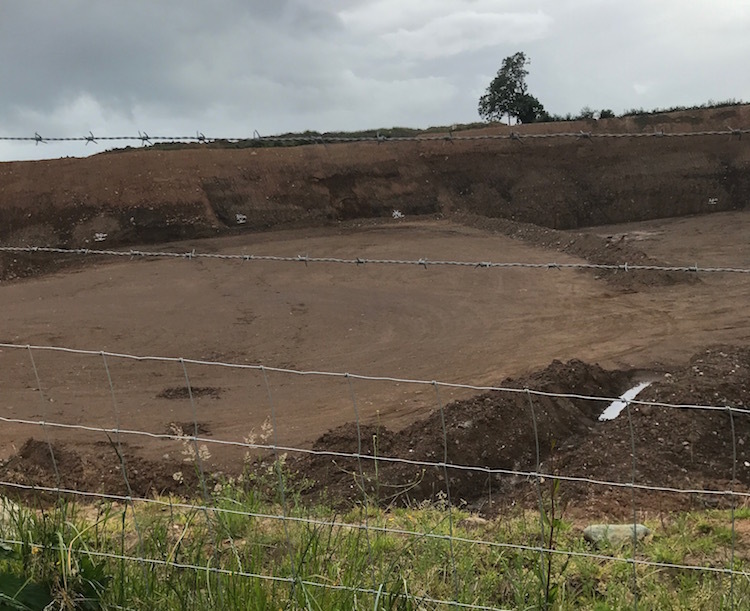 The scheme continues to make use of six huge "borrow pits", five of which are in use and the sixth (near Deerpark Road between Castledawson and Toome) is to come into operation by the end of the month. The contractor tries to keep a cut-fill balance, ie material excavated from one part of the site is used on other parts of the site so that very little material has to be disposed of off site. However the issue is that the material is not all of the same quality, ie not all of it is suitable for use in construction. 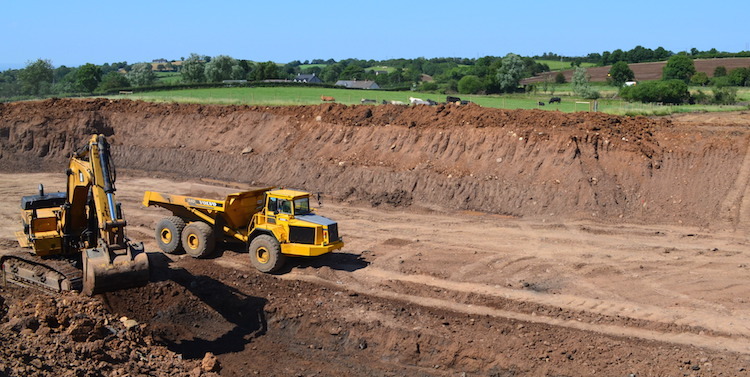 Borrow pits allow good quality material to be excavated for the fills, and then poorer quality material from cuttings is put back into the borrow pits. When the scheme is completed the topsoil is restored and it looks as if the pit was never there (hence "borrow" pit). The last picture below was sent by a site visitor who prefers to remain anonymous - thank you - and shows the borrow pit near Bellshill Road. It's hard to get a sense of scale, but the pit looks to be around 30 metres deep, and that is a mature tree above. The contractor will certainly have benefitted from the fanstastic weather over the past two months. Major earthworks on part of the stretch between Toome and Deerpark Road will have to pause come October due to the presence of overwintering swans, but the contractor appears to have made good progress on this stretch. A reminder that the contractor puts up regular aerial videos here. If they seem obsessed with borrow pits it's because the videos (sadly!) aren't there for the benefit of infrastructure enthusiasts, but to allow the engineers to monitor the movement of material around the site. 24 Jun 2018: The contractor (Graham & Farrans) and the Institution of Civil Engineers jointly held an open day on the site yesterday. 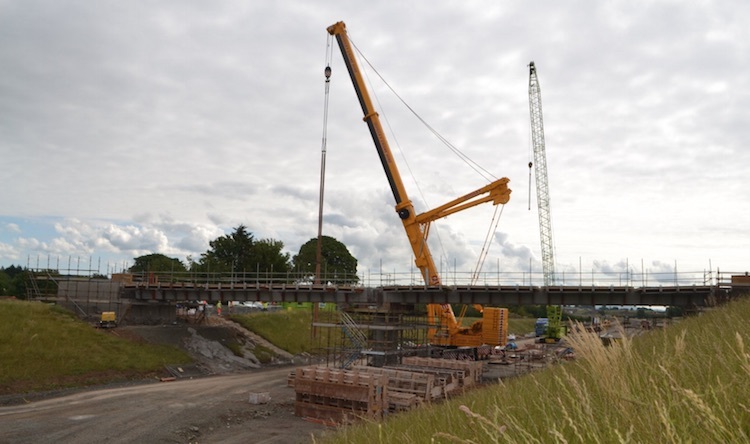 Visitors were treated to a presentation about the scheme, a demo of a 3D VR headset that civil engineers use, and then a hard-hat visit to the Bellshill Road flyover construction site on the Castledawson Bypass. So thank you very much to them. I've included some shots below. The scheme is progressing on schedule. The eastern part of the scheme (Randalstown to Toome) should open to traffic just over a year from now, in "late summer 2019". 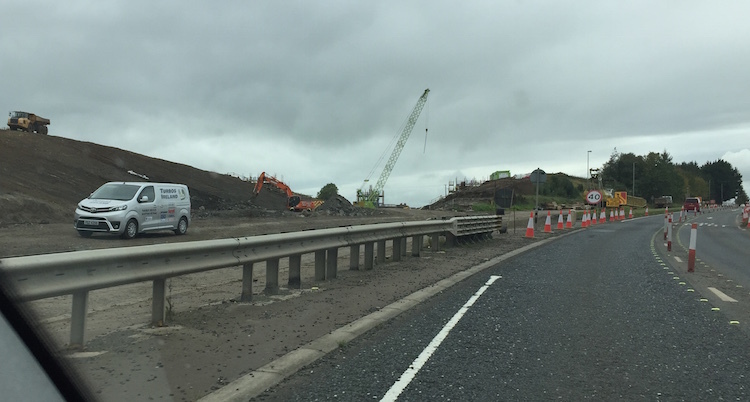 On the Castledawson Bypass, which is being widened, the westbound carriageway is under construction and it's likely that all traffic will be switched onto it later in the summer to allow the current road to be reconstructed to form the new eastbound carriageway. Opening of the western part of the scheme (Toome to Castledawson), which has more challenges (softer land, more environmental restrictions, being partly online) will come either at the end of 2020 or the start of 2021. You can see a computer-generated aerial movie of the stretch as it was last week. The contractor is putting these movies up every couple of weeks, which is great, though they are mainly done to allow them to track the movement of fill material around the site. Pic 1: Future westbound carriageway of the A6 approaching Bellshill Road on 24 June 2018. The ground here was dug down to 2 metres below the adjacent ground level and then filled up to about 2 metres above that level. The gravel on the right is the subsurface of the future road. [Wesley Johnston]. Pic 2: Earth embankment that will carry the east-facing sliproads from the Bellshill Road flyover onto the A6 on 24 June 2018. The current A6 Castledawson Bypass is just ahead. The photographer is standing on what will be the central reservation. [Wesley Johnston]. Pic 3: Members of the public at the ICE open day walking towards Bellshill Road flyover on their gudied tour on 24 June 2018, on what will be the future westbound carriageway. [Wesley Johnston]. Pic 4: Underneath of the Bellshill Road flyover on 24 June 2018. The bridge consists of two abutments, four central columns (shown here) and eight beams. Once the beams are put in place plastic formwork sheets are inserted between them (visible here) and the concrete deck poured on top. The road is then constructed directly on the deck. [Wesley Johnston]. Pic 5: Newly completed parapet on Bellshill Road bridge on 24 June 2018. The red "formwork" that can be seen on the left previously ran right across the bridge and was used to case the concrete. Now that the parapet has been completed, the formwork can be removed. The bridge is not yet open as the approach embankments are still under construciton. [Wesley Johnston]. Pic 6: View east towards te Moyola Road bridge on 24 June 2018. The section ahead will carry the future westbound carriagway. Due to increased environmental standards, this bridge gives over a metre greater clearance over the river than the 1990 bridge to the left of it. [Wesley Johnston]. 13 May 2018: Construction of this scheme has just passed its first anniversary, and there is now just a year or so to go until the stretch from Randalstown to Toome opens to traffic (officially due to open "during 2019"). There will be few travellers who will miss the Moneynick Road that it will replace! Work on this stretch continues to advance well, and this is best seen via this computer-generated aerial movie of the stretch as it was last week. The movie begins at the Drumderg roundabout at Toome, and you can see the new footbridge now in place at 00:06, as well as the new park-and-ride facility underway. The existing park-and-ride car park, on the opposite side of the roundabout, will be removed to make way for the enlarged roundabout and connection to the new dual-carriageway. (I will resist the temptation to discuss yet again what a shame it is that this roundabout is to remain!) 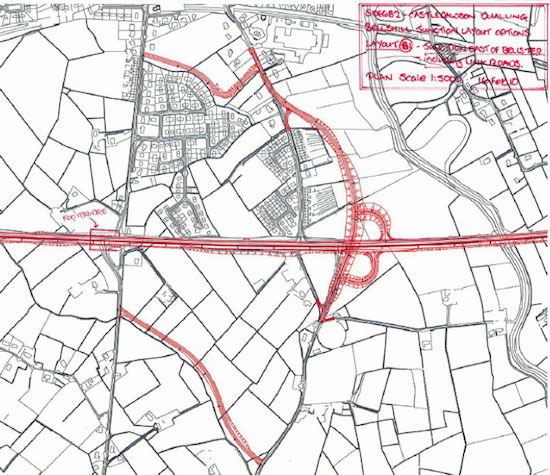 The flight then goes along the offline route of the new dual-carriageway showing (for example) the new Ballynafey Road overbridge with beams in place at 1:27, box culverts at 1:39 and 1:46, a significant cutting at 1:52, foundations for an agrticultural accommodation overbridge going in at 2:10, gravel foundations being put in place between 2:20 and 2:35, the new Derrygowan Road overbridge in place (minus its approach ramps) at 2:35, the cutting to approach the existing M22 (which has still not been cut through the final stretch) at 3:07, and finally the Randalstown West bridge in place at 3:12. 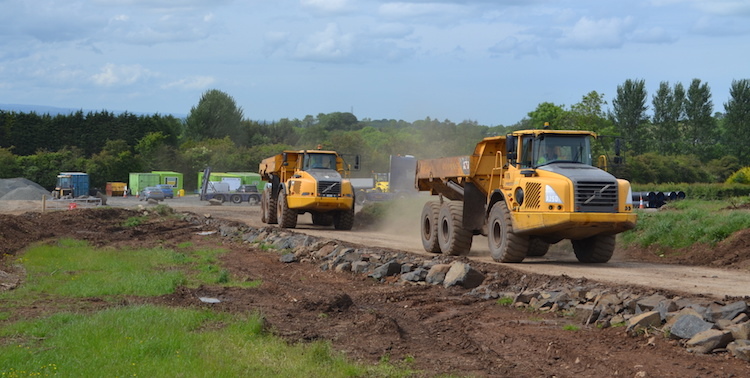 Work is also underway on the Castledawson to Toome stretch. This is best seen in the first two photographs below (kindly sent by Damien Devlin of Jupe a couple of weeks ago but which I have only just got a chance to put up) and also in this computer-generated aerial movie of the stretch as it was on Friday. The notes on the video advise that due to windy conditions some sections are missing. The video begins at Castledawson Roundabout, which has had trees felled to make way for a planned new footbridge structure. 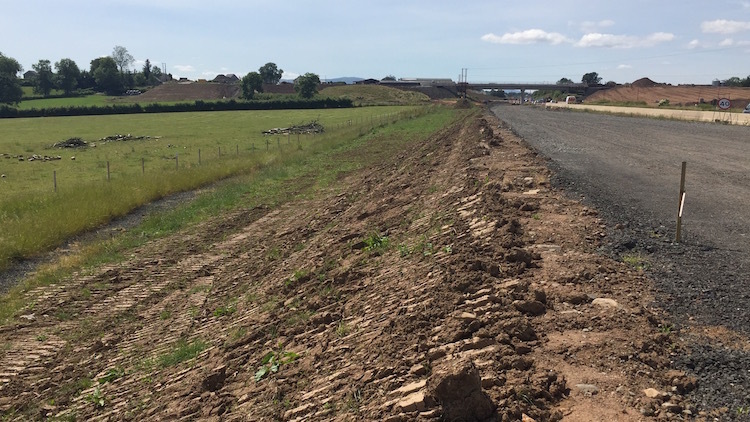 Continuing along the existing Castledawson Bypass you can see that the embankment for the widened road is almost complete with gravel foundations in place on a long stretch. The new Bellshill Road/Annaghmore Road flyover is visible at 0:37. This bridge also requires construction of a new local road which, if you are interested, is covered separately in this movie. Bellshill Road flyover has now had its deck completed and the temporary formwork was removed yesterday. The widened bridge over the Moyola river is visible at 0:48, with its deck under construction. The visuals reappear at 01:00, which is the point at which the stretch where work was paused during a legal challenge begins. Significant process can be seen since work began in March, including a new temporary road to carry Hillhead Road traffic around the construction site of a future overbridge at 1:19. No earthworks appear to have yet begun between here and Deerpark Road, visible at 1:56, but after this major earthworks now appear to be underway along the stretch that runs parallel to Lough Beg. At 2:35 the view reaches the site of the future Creagh grade-separated junction, with the loop for the eastbound sliproads visible on the left but no sign yet of the future flyover. 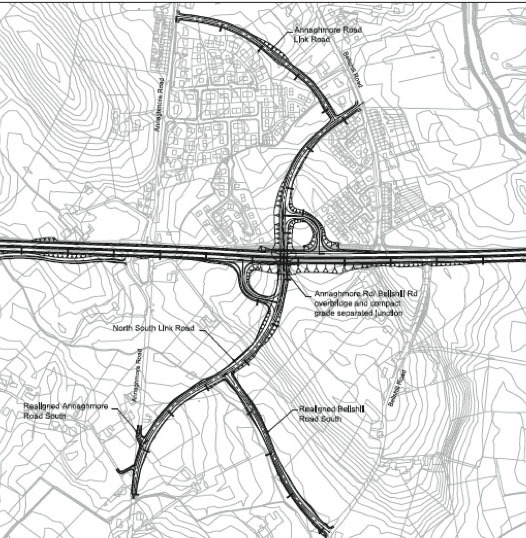 This junction will be linked by a short stretch of new road to the existing Creagh roundabout. Finally, at 2:46, the view reaches the existing Toome Bypass where the stretch terminates. The photographs below show some of the same things but higher-resolution. My thanks to Shay Sweetnam and Damien Devlin of Jupe for sending me these images to share. Excellent work by all involved in the scheme. A reminder once again that the contractor is maintaining a very useful web site that gives advance notice of the dates of planned closures as well as progress notes and photographs of their own. View east along the A6 Castledawson Bypass on 29 April 2018 showing the foundation for the future westbound carriageway now in place, with all traffic using the existing road which will be reconstructed later to become the eastbound carriageway [Damien Devlin]. 21 Apr 2018: From the point of view of the travelling public, considerable change has been evident in the past two weeks. 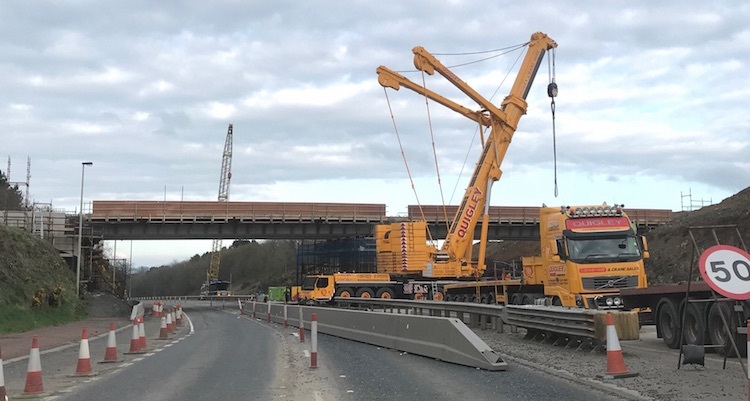 Firstly, the bridge beams for the Randalstown West grade-separated junction (Artresnahan, at the end of the M22 motorway) were lifted into place during a weekend closure on 13-15 April. The bridge consists of two spans, the central pillars of which occupy what was the westbound carriageway of the M22, hence why the M22 reduces to one lane each way further back. Each span consists of five 30 metre beams, each weighing 60 tonnes, meaning a total of ten beams were lifted over the weekend. The pictures below were taken from a DFI tweet and show the beams in place. Great work by the contractor. 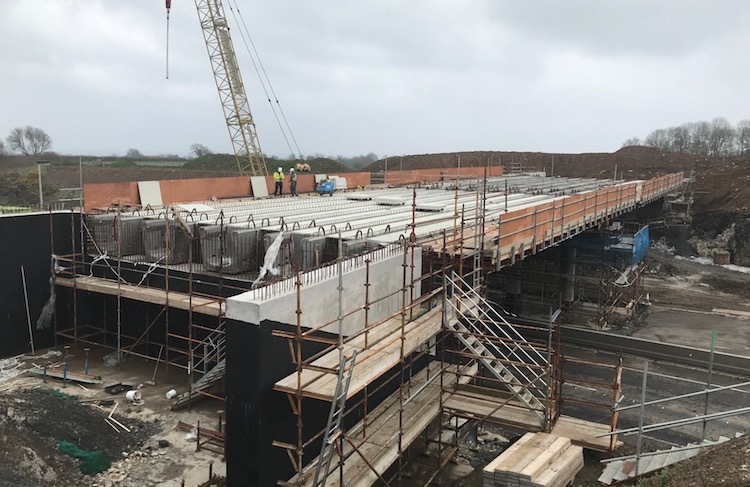 A further 15 bridge beams for the widened bridge over the Moyola River near Castledawson were also lifted into place over the past week. Tomorrow (Sunday) will see the installation of the deck of the new footbridge over the Toome Bypass at Drumderg roundabout, which is to provide pedestrian access to the relocated park-and-ride site. The concrete bridge pillars are already in situ, but the deck itself is a steel arch structure which is already on site, ready to be placed atop the pillars. The pictures below of this bridge are taken from another DFI tweet. The other obvious change for the public is the creation of a new roundabout at Derryhollagh Road between Toome and Randalstown. This may be a nuisance, but is required to facilitate the safe access to the side road for construction vehicles on this very busy, bendy road. The roundabout will be removed at a later date. Finally, a reminder that you can get up-to-date information on the works at the contractor's own web site. 3 Apr 2018: The past fortnight has seen another milestone on the construction of this new road, and that is the commencement of work on the stretch from The Creagh to Hillhead Road. Work on this stretch had been delayed initially by an unsuccessful legal challenge, and then by the environmental requirement not to carry out major works in this area during the swan overwintering season. 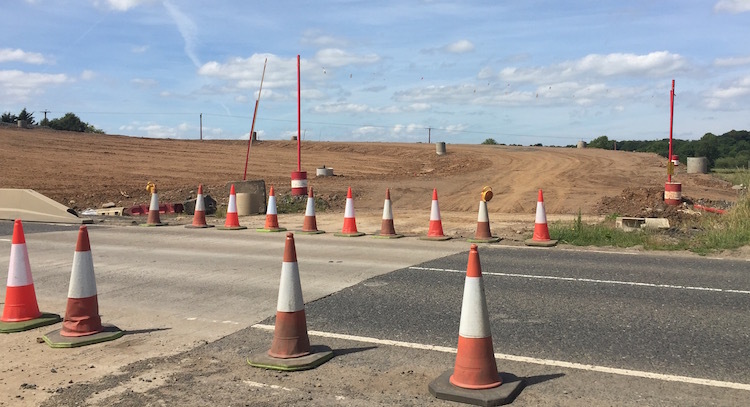 However this restriction ended in mid March and work has now commenced on the stretch - a milestone as it means that work is finally underway on all parts of the scheme. Matthew Cole took some photos of these earthworks advancing away from The Creagh four days ago and posted them here on Twitter. An aerial YouTube video of the same area uploaded on 29 March can be viewed here. Work has now been underway for ten months and progress continues to be excellent. 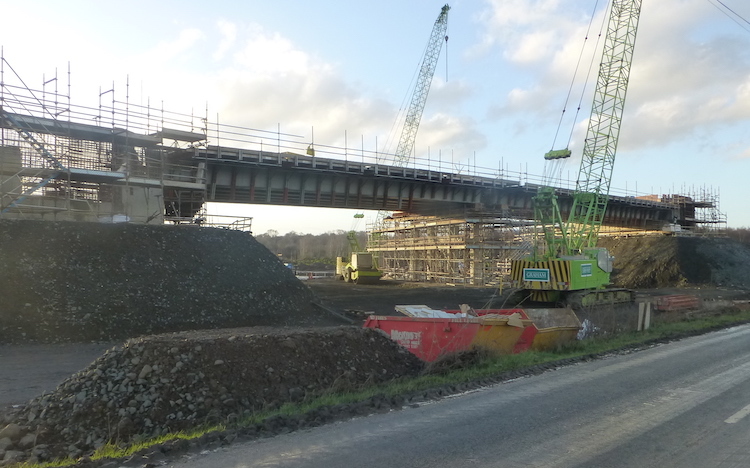 About a fortnight ago the beams for the Ballynafey Road overbridge were craned into position. This is reported on the contractor's own web site, which is being regularly updated with lots of interesting information and photos and is well worth bookmarking. 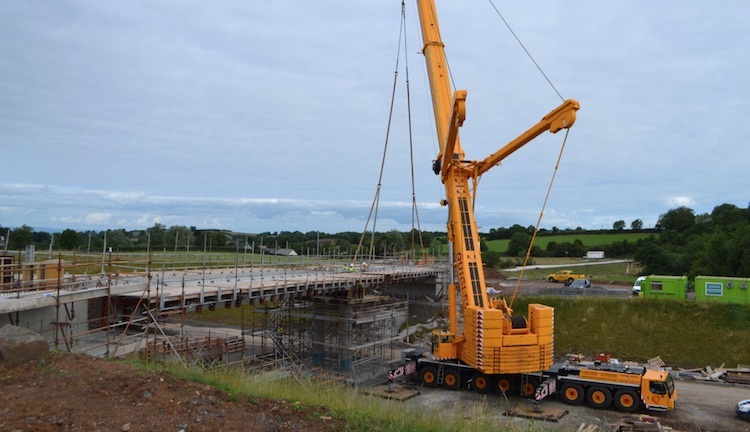 According to that web site, the bridge beams for the Randalstown West overbridge (at the end of the M22) are scheduled to be lifted into place between 13 and 16 April, requiring a weekend closure of the A6 here. 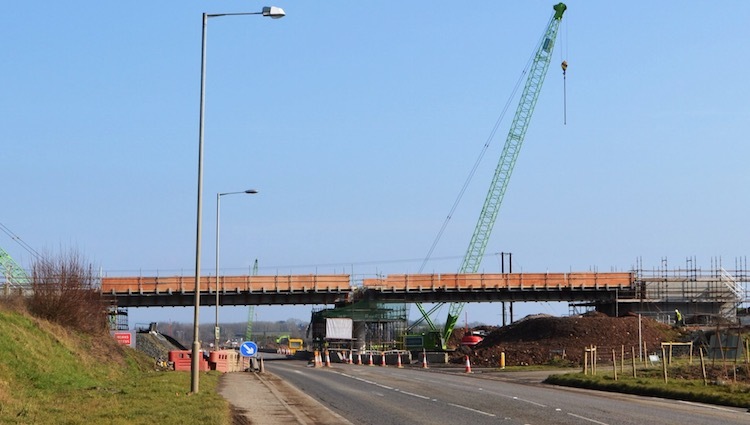 Two other lifts planned in the near future are the beams for the widened bridge over the River Moyola (11-13 April) and the installation of the footbridge that is currently under construction at the start of the Toome Bypass at Drumderg roundabout. 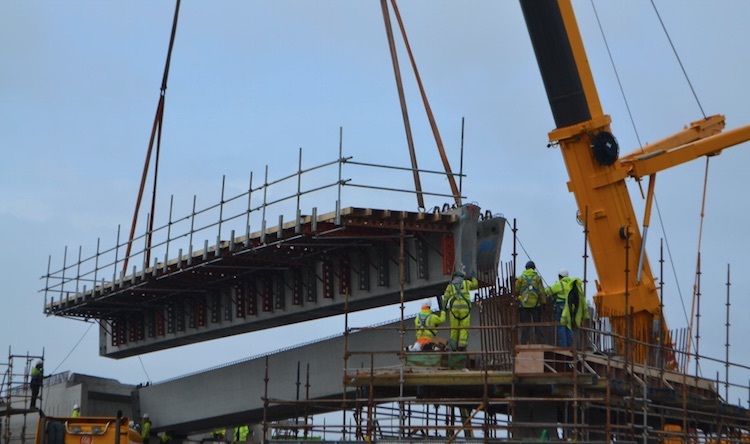 13 Mar 2018: Last weekend saw a great deal of excitement on the scheme with a major beam lift taking place at Bellshill Road on the Castedawson Bypass. 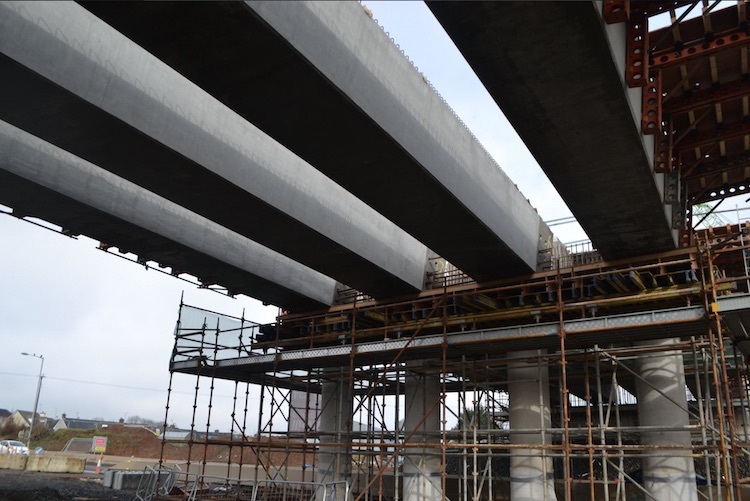 The flyover requires 8 reinforced concrete beams, 4 each on two spans, that will carry Bellshill Road over the new dual-carriageway. 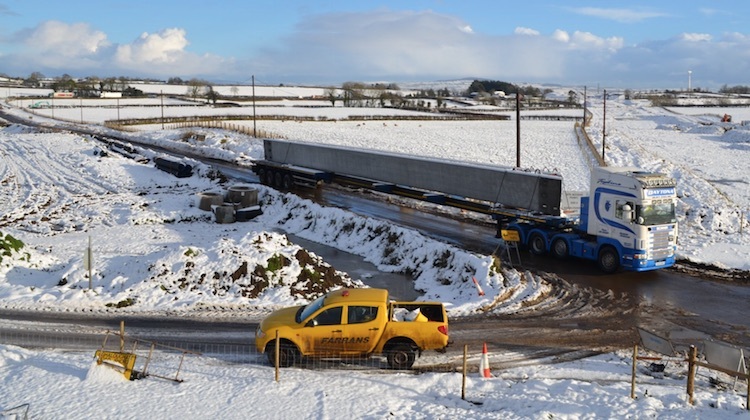 The beams are so large that they require a lorry each and they were seen parked up at the end of the M22 near Randalstown the week prior to the lift. The A6 at Castledawson was closed over the weekend and the beams were carried along the Moneynick Road via Toome (spotted by one eagle-eyed infrastructure fan) on Friday night. The lift itself seems to have had perfect weather and all eight beams were firmly in place by the time the road reopened. Several more infrastructure fans photographed the lift and the outcome. The pictures below are DFI photos and show the result. For safety and efficiency the four outermost beams had their falsework (temporary construction platforms) already bolted on prior to the lift. Thank you to all the people who tweeted updates and sent me photos - it is great to see how many people out there are interested in this project. Well done to the contractor. 20 Feb 2018: Work continues well on both halves of the scheme. 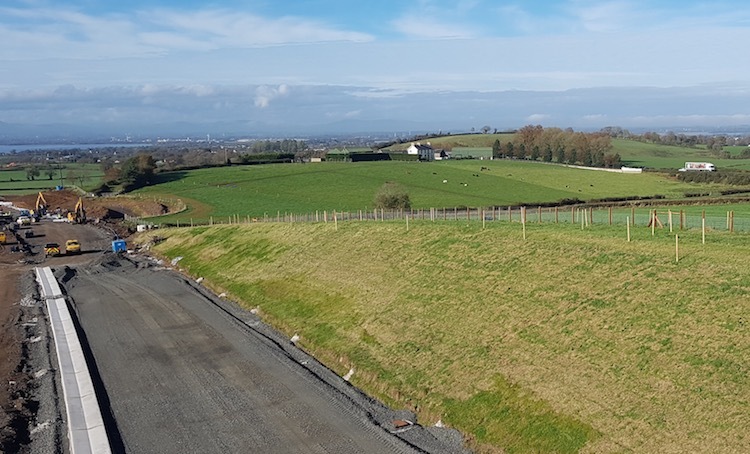 On the entirely offline Randalstown to Toome stretch work has been focused on building culverts for the numerous watercourses on the stretch, and creating large cuttings and embankments to allow the road to traverse the hilly terrain. This computer-generated aerial video, put up by the contractor on 19 Feb, shows a typical 1.5 km stretch of the new road showing all these features. The road is designed to have a cut/fill balance, ie material cut from one place is used as fill elsewhere. However it often happens that the fill is needed before the cuts are done, or that the fill needs to be of a different type than the material sourced from the cuts. This problem is resolved by taking rock out of a "borrow pit", which is later filled in again with fill. Borrow pit "K", located close to Moneynick Primary School, has seen explosives used to blast out the rock. You can see a video of a blast (from last December) here with the blast happening at 00:17, and an aerial video of how borrow pit K looked this week here. Blasting in another borrow pit is close to the current A6 meaning the road has to be shut for 30 minutes during blasting. At the tie-in to the end of the M22 at Randalstown, construction of the future flyover is underway, with all traffic shifted over to one side to make space for the work. At the Toome end, work to enlarge the 14 year old Drumderg roundabout is also well underway. This aerial movie shows the current state of works with the curved road at the top left of the video (at the very start) being the new bit of road that will allow the existing Moneynick Road to be accessed once the dual-carriageway opens. 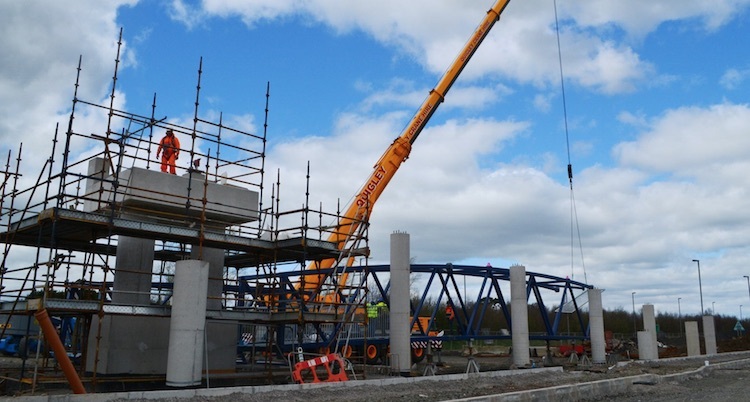 A footbridge is also being built over the start of the existing Toome Bypass in order to provide access to the new park-and-ride facility which will be sited on the far side of the roundabout. On the partly online Toome to Castledawson stretch, intense work is taking place to widen the existing Castledawon Bypass (itself opened in 1992). This involves two major bridges - a flyover at Bellshill Road, and widening the bridge over the Moyola River. Because the route on this stretch is literally on top of the existing road, we are currently experiencing a series of unavoidable weekend closures that began on 26 January and will disrupt Belfast-Derry traffic until at least mid March. 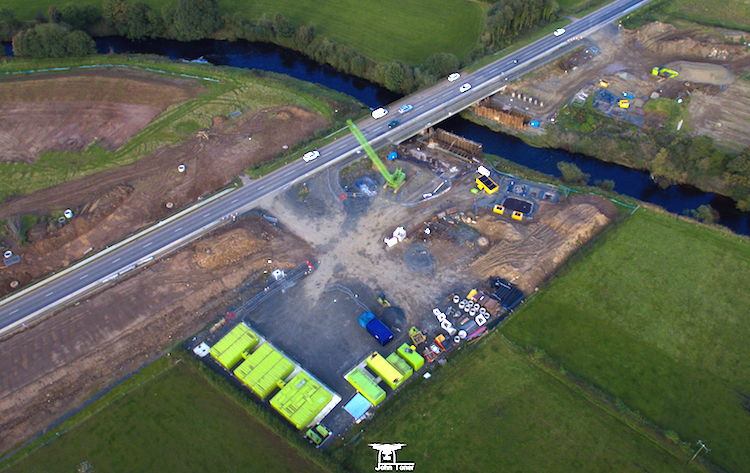 This aerial video begins at the Moyola Bridge and then heads east, and shows progress as of last week. You can see the proximity of the works to the existing road. At 00:15 in the video you can see the route of the new dual-carriageway heading offline to the left. This is the start of the offline stretch that passes near Lough Beg. Work on this stretch is currently paused due to overwintering swans, but is due to commence within the next couple of months. Work has now been underway on the project for 9 months. With thanks to David Chambers for a correction to the borrow pit identifications. 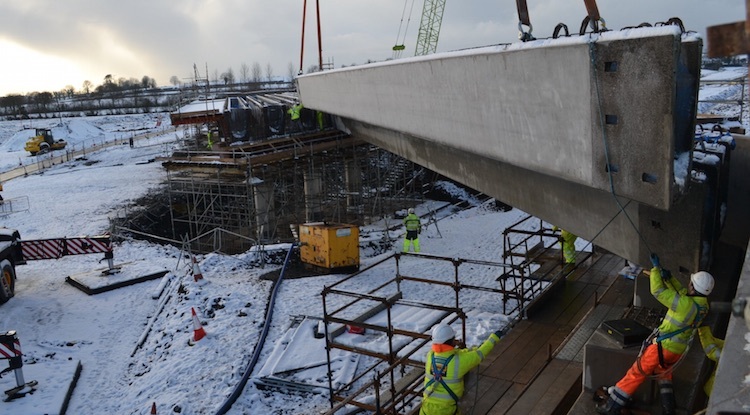 7 Jan 2018: December saw low temperatures and a lot of snow, but it didn't stop the contractors (Graham Farrans Joint Venture) who installed the first bridge beams on the scheme in the middle of the month. The beams were for an overbridge that will carry Derrygowan Road over the new dual-carriageway between Toome and Randalstown. The photos below were taken from the Department for Infrastructure's Twitter feed. They show how the bridge consists of two abutments, plus a set of central columns in what will be the central reservation, creating two spans. The precast concrete beams were put in place over the course of two days, five for each span. The scale of these beams is enormous - the first photo shows that they are so large and heavy that they require a lorry each! The contractor has put up an article on the lift on their new dedicated web site here. The new web site for the scheme can be accessed at www.a6rcdualling.co.uk which contains updates and photos and well worth checking out. It is also worth watching two movies on YouTube which are computer-enhanced flythroughs of the scheme as it looked in mid December. The first movie, here, starts at Castledawson Roundabout and travels 4km east to near Toome. Beyond this, in the vicinity of Toome, there is currently a moratorium on major earthworks taking place due to overwintering swans, but this will cease to be a restriction in March at which point earthworks can commence here too. The second movie begins at Drumderg roundabout east of Toome (note the new footbridge over the Toome Bypass being built at 00:04) and goes 7km east, all the way to Randalstown. Derrygowan Road bridge appears at 02:12, though the video was made before the beams were in place. At the end of the scheme, you can see the foundations of the bridge at the future grade separated junction at the end of the M22 at 02:48. Work has now been underway for seven months, with three years to go until completion of the whole project. 30 Nov 2017: A very quick update to share another aerial movie which has been posted on YouTube by JUPE, showing progress on the Castledawson Bypass around a month ago (apologies for the delay in posting this). 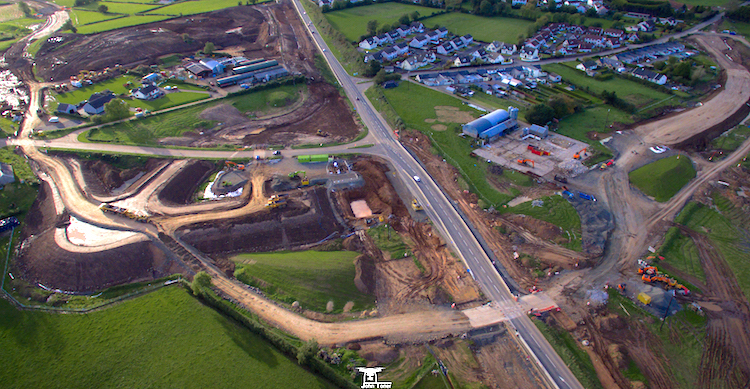 At time index 0:55 you an see a good top view of the new Bellshill Road/Annaghmore Road grade separated junction with the foundations of the bridge piers now in place. On the rest of the scheme work seems to be progressing well, though delays on the westbound M22 at Randalstown due to the roadworks continue to cause considerable delays and consternation on social media. 14 Oct 2017: The scheme has now been underway for about 5 months, and there has been a lot of progress at some points. I have 6 photos to share this time, the first 3 of which are with thanks to the contractor Graham/Farrans and the second 3 of which are with thanks to John Toner, who took aerial photos from a drone. The first three pictures below were taken on the Randalstown-Toome stretch where work to date seems to be focused on major earthworks, in particular a very large excavation. I am not 100% sure whether this is a cutting or the road itself, or whether it is some kidn of 'borrow pit', but either way it looks to be at least 20 metres deep. 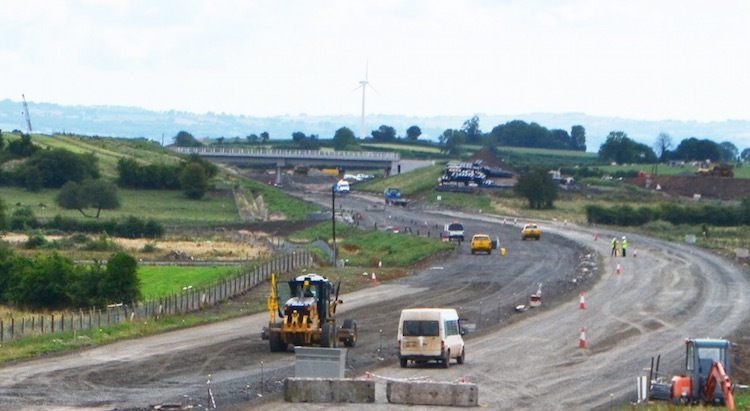 The second set of images show works on the Castledawson Bypass at the western end of the scheme. This road only dates back to the mid 1990s but is being upgraded to dual-carriageway standard as part of the scheme. This includes a major junction with Bellshill Road which looks very advanced with most of the approach embankments now in place. Work appears to have begun on the foundations for the flyover at its centre. Work on the second bridge over the Moyola River (adjacent to the existing structure) is more advanced with work on the two abutments well underway. Working close to the River involves a lot of environmental constraints - for example, it appears that the contractor cannot operate machinery in the river itself, as would have happened in years gone by. Finally, a video has appeared on YouTube showing aerial views of a range of locations but showing the Castledawson Bypass around 3:00. 19 Sep 2017: Today saw the ruling on the appeal by environmentalist Chris Murphy to the judicial review that he lost in March. He was challenging the legality of the DFI's environmental assessments on the section of the road between Toome and Castledawson (the legally contested stretch being specifically the stretch from the western end of the Toome Bypass to Deerpark Road). In the event the judges dismissed all of Mr Murphy's points and ruled that the DFI had correctly complied with relevant environmental legislation. The summary judgement is available on the Courts Service web site here. Notably the judges expressed the view that a delay of several years between a project being approved and work commencing (as was the case here and which Mr Murphy felt necessitated a further assessment) is not unreasonable: "The Habitats Directive imposes no time constraint on the duration of an appropriate assessment and in the case of major infrastructural projects there is often a likelihood of some time lag between authorization and implementation of the project”. DFI, for their part, immediately welcomed the ruling in their favour with a press release. Mr Murphy has the option of attempting to appeal to the Supreme Court and has indicated that this is an option he will consider. In their press release DFI says "As a result of the judgement the Department will commence construction of the Toome to Moyola River section of the scheme which had been delayed due to the legal challenge". By way of background, DFI had previously agreed not to begin major works on the stretch from Toome to the Moyola River in Castledawson, so works undertaken to date have been restricted to the Randalstown to Toome stretch, and the bit west of the Moyola River. The map below illustrates the situation with the works already underway shown in dark blue. The ruling means that DFI are now free to begin work on the Toome to Moyola stretch. However, a complication is that the Environmental Statement imposes a restriction that major earthworks (note, not "all" works) cannot take place between Deerpark Road and Toome between late September and mid March. This is for environmental reasons and is not directly related to the legal challenge. I would define "major earthworks" to be anything that involves constructing the bed of the road itself, so I would consider embankments, cuttings or bridges to be "major earthworks". DFI have not said when they intend to start work, but having now successfully defended two legal challenges I would say they will be in no mood for further delay and so I would expect to see work begin on the Moyola River to Deerpark Road stretch within days. We are likely also to see minor works commencing on the contested Deerpark Road to Toome stretch in the coming weeks (eg vegetation clearance, fencing etc), but we will not see major earthworks until mid March due to the restrictions of the Environmental Statement. Again, the map below attemps to summarise this and help make sense of all these different stretches. Status of the A6 dualling scheme as of 19 Sep 2017. 5 Sep 2017: Progress on the scheme seems to be going very well. This update by Farrans (one of the contractors) shows some closeup images of the work underway, including a deeper excavation - it's hard to tell from the image but this is either a cutting for the road itself, or else some kind of borrow pit for sourcing material. Either way good weather during the summer seems to have helped. Meanwhile, a court hearing took place on 15 August. This is an appeal by environmentalist Chris Murphy to the judicial review that he lost in March. He is challenging the section of the road between Toome and Castledawson. The judges reserved their judgement, which was then due to be given yesterday, but has apparently been delayed to sometime "later in the week". The substance of the appeal appears to be Mr Murphy's argument that the environmental assessments were out of date and did not take into account more recent considerations and environmental legislation. DFI Roads obviously defended their assessments vigorously. Originally the verdict was to have been given on the same day, so the decision to reserve judgement tells us that the verdict is not straightforward. This implies to me that Mr Murphy has at least got an arguable case. Regardless of the strong desire by many, especially in the North West, to have this road built, the judges will decide the case on the immediately relevant legal facts only. My (admittedly only superficially informed) impression of the case is that it could go either way. Both sides in the case do, of course, have options for further appeals (eg the Supreme Court or even the European Court) so whether DFI win or lose, this saga could be far from over. 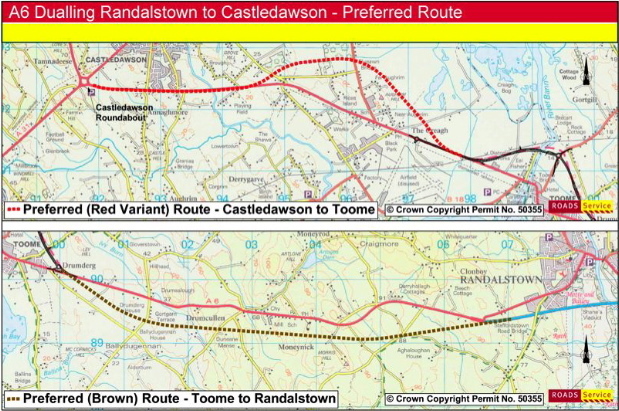 If, hypothetically, DFI were to lose then it would probably mean going back to square one in terms of route selection and environmental assessments which would add a period of years, rather than months, to the completion of the delayed section between Castledawson and Randalstown. Finally, the works have required a lane closure at the western end of the M22 which has caused significant tailbacks westbound in recent days. This is slightly puzzling as the road always went down from two lanes to one at the end of the M22, it is just the location that has changed. Perhaps someone in DFI Roads more familiar with the setup might be able to see if anything could be done to ease the merge as it is going to last several months. For updates prior to September 2017 please see the archive.